That’s why I’m all too happy to be the recipient of two Baggu reusable bags. They’re made of tough materials, yet very light and compact. They’re huge – perfect for a day of shopping or for bringing the laundry to the laundromat. It comes in a wide array of colors to match any outfit. This one of those things that I have been given to try, and being a recent convert to bringing my own water bottle whenever I go out, this was a very welcome token. Using water bottles not only help save the environment, and it helps you save money too. Bobble’s selling point is that they have this carbon filter that “removes chlorine and organic contaminants in the water.” It’s also BPA-free, and since it’s reusable, that’s one less plastic bottle in the landfill. 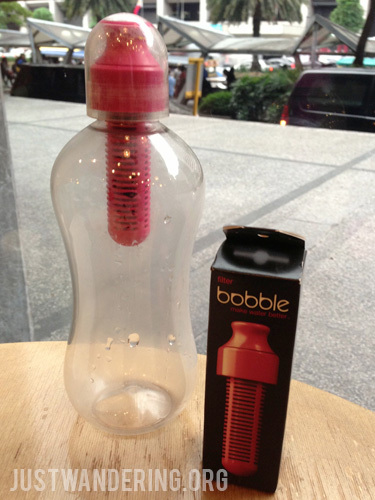 While I like reusable water bottles, I’m not entirely sold on Bobble. It’s mostly because of my personal preferences: I do not like sipping water from a spout like that. But that’s just me. Try it out, specially if you’re particular about the way your water taste. Admit it, when you have a holiday coming up, you sometimes get an urge to shop for clothes, accessories, or gear that you want to use on that trip. It’s all well and good, but one of the biggest no-no is saving using the new items for the trip itself, meaning you have no chance to test beforehand if they are as comfortable when worn longer than the 1 minute you had it on in the fitting room. Completely forgot to take a photo in the wild. That goes double for shoes. If you’re on a trip that would require you to walk and be on your feet several hours a day, you need to have really comfortable footwear, otherwise you’d have a miserable time. That’s why it’s good to have a back up footwear that you can turn to when your feet starts complaining. 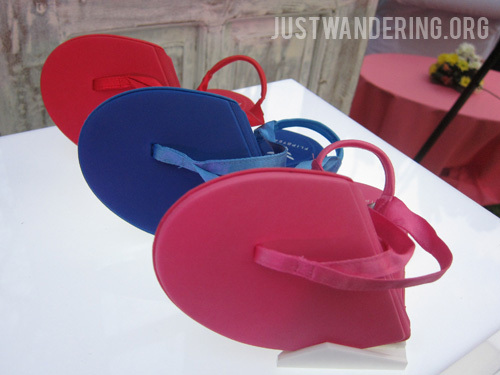 In comes Flipsters, these cute foldable flip-flops and shoes that is so compact, it can fit in your handbag. They’re lightweight as well, so it won’t tip the scales when you pack it. While the rubber sole is very thin, it doesn’t feel as if you’re walking barefoot on gravel. It does offer some protection from the pavement, but bear in mind that these are only for short walks, not for traipsing around town the entire day. 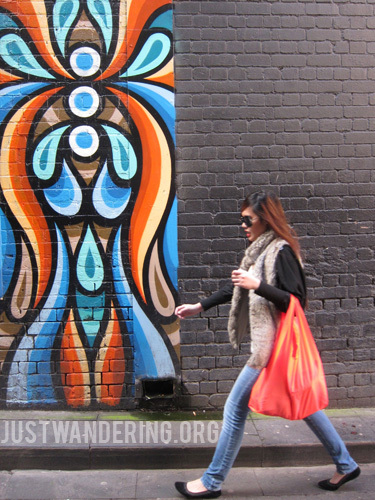 Carrying a heavy bag can be very bad for the body, whether it’s a shoulder bag, a back pack, or even a rolling luggage. Lately, I’ve been partial to bags with long straps so that I can sling it across my shoulders, making it more comfortable to walk around with. Apparently, plenty of other people have the same idea, and someone came up with the Healthy Back Bag. It has a unique shape that distributes the weight on your back and is very close to your body. It’s quite comfortable to walk around with that on my back, and there are plenty of pockets both inside and out. The one I got is purple and looks very casual, but apparently, it comes in a very wide variety of designs and color. In the age of cellphones, tablets, and other gadgets, you’ll often find your bag filled with cords, cables, and plugs for all your devices. You’ll probably need at least two or three, and chances are, your hostel would only have one electrical socket. 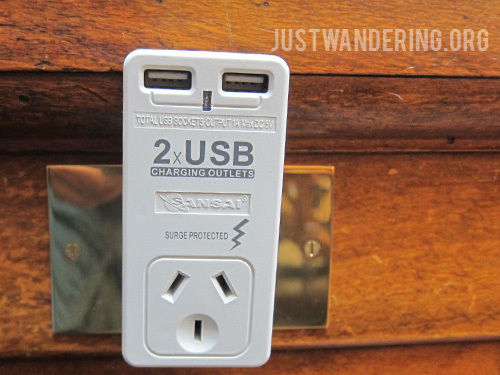 That’s why I rejoiced at finding this USB wall charger in Melbourne that lets me charge at least two devices at the same time, and leaves an extra socket for any additional gadget. I left this one for my sister to use, but I’m on the lookout for something similar that is a better fit for the plugs of my chargers. I haven’t been able to check the local shops yet, but both Korjo and Belkin have something worth considering. Earphones are very high on my list of must-brings. Listening to music is something that helps keep my sanity when I’m traveling, or even just when I’m commuting around Metro Manila. I used to prefer earphones, as they take up less space, but I’ve been having recurring problems with my ears, so I figured it’s high time that I switch to headphones. Free, because they’re already discontinued. Pfft. Now, I’m not one of those who wants fancy headphones – my only requirement is that it lets me listen to music. I bought a Philips one for Php 1,499, but after hours of use, it started hurting around my ears. Less than a month after getting it, I got these Urbanears Tanto free with my purchase from Beyond the Box. The Urbanears headphones and earphones have caught my eyes years ago, but I’ve found their prices too high. However, now that I’ve tried it, I’m more inclined to buy from them when the time comes to replace these. 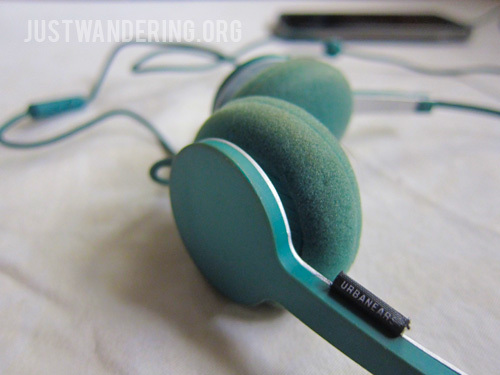 Unlike the other headphones, the Tanto is very comfortable. It looks too tiny for my gargantuan head, but it fits and it fits really well. I used these headphones instead of the stock headphones Cathay Pacific handed out (the one I got was broken), and used it for at least 8 hours straight. It felt so comfortable, I hardly noticed it was there. Don’t ask me about the sound quality, because I’m not very particular about that. It doesn’t have its own volume control, but it does have a mic and an answer button, so if you’re listening to music from your phone, you can easily answer it without taking off the headphones. Disclosure: In case it wasn’t obvious, Bobble, Flipster, Baggu, and Healthy Backpack were all given to me for review and/or possible inclusion in the blog. The headphones also sit very comfortable (yet not loosly) which alows me to wear them for hours (5-8) while working without hurting my ears or squeezing my head.